There's a lot of talk these days about the value of higher education. In this series, McGill's Senior Director of Communications and Planning, Sue Murley, digs into a variety of reliable sources and pulls out the facts as they relate to a continuing debate about the respective outcomes of universities and colleges. There’s a lot of talk these days about the value of higher education. In this series, McGill’s Senior Director of Communications and Planning, Sue Murley, digs into a variety of reliable sources and pulls out the facts as they relate to a continuing debate about the respective outcomes of universities and colleges. We hope you enjoy her reports on this important issue. I couldn’t believe more strongly that the value of an education goes beyond how much bacon you can bring home. Nonetheless, I also think it’s important for high school students and their families to have an idea of average income levels for various fields of study and levels of education. And this information is not particularly easy to find. 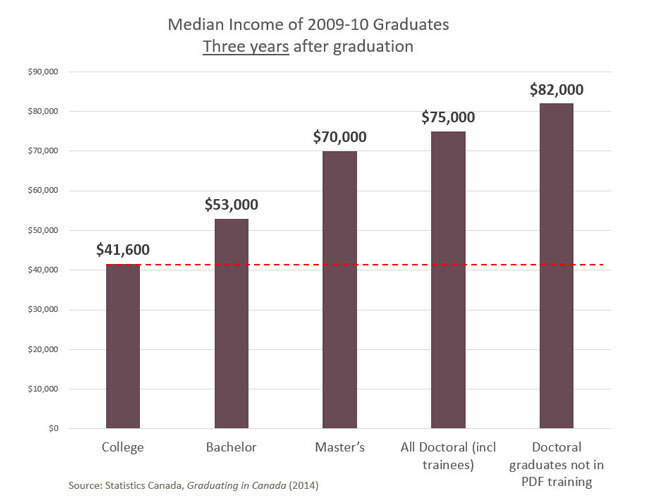 Last year, Statistics Canada published Graduating in Canada. It tracked 2009-10 graduates holding college diplomas, bachelor’s, master’s and PhD degrees and looked at their employment outcomes – by field of study – in 2012, three years after graduation. Here’s the average income for overall levels of education, for 2009-10 graduates working full-time. Not bad, particularly because this period couldn’t have been the easiest time to get a job, after the financial meltdown in late 2008. Despite the idea that we generally have of humanities graduates making a lot less than the holders of more practical college diplomas, bachelor’s grads in the humanities make more than college grads in any field other than engineering/architecture. What really surprised me is that their average income is also higher than bachelor’s holders in the physical and life sciences. (I had to go back and check the report to make sure I hadn’t made a mistake.) 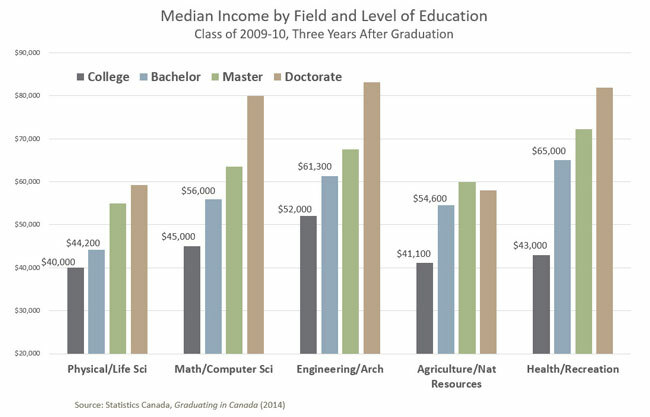 In fact, since we hear so much about how Canada needs STEM (Science, Technology, Engineering, Math) graduates, you would think that salaries for science grads would be higher? Any surprises for you? Any theories as to why salaries for science grads are not higher? ** I included only the fields of study that had graduates across all levels of education – so not Personal, Protective and Transportation Services. Full information is found in the Graduating in Canada study, Table A11, pp 51-52. Sue Murley is Senior Director, Strategic Communications and Planning at McGill and holds a PhD in English Literature. This post reflects her personal opinions, not the official position of McGill University. 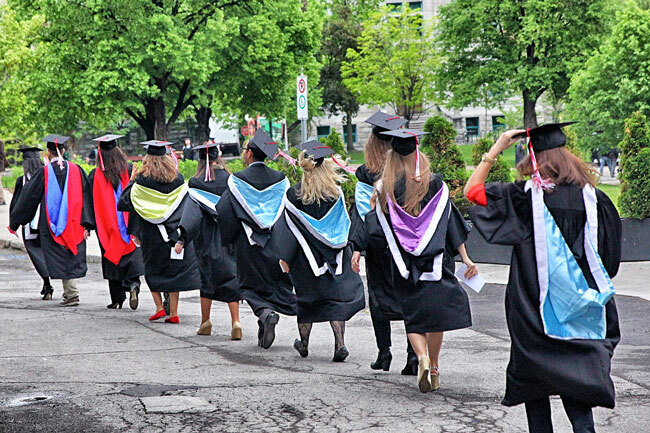 Do international students stay in Canada after graduation? Sorry to tell you this poll is wrong. Masters students from McGill are not able to land decent job. It’s a waste of time. Interesting, but intuitively I feel the info in this article must be false or incomplete… It would be helpful to also include data on whether or not graduates were working in a field related to their diploma. I, for example, graduated in PoliSci and ended up working in the resource sector, based on non-academic qualifications and network connections. It was very lucrative – but had nothing to do with my diploma, except that I had one, which was all the company wanted in any case. I suspect this is true for many arts/humanities/social sciences graduates, and it certainly seems to be the case in professional life where almost everyone you meet has got some kind of arts background that they never really put to use. On another note, and not that this post is going to reach a wide audience, but I feel that students and young people thinking of entering University should be made aware that academic institutions are fond of producing this kind of data – showcasing the high return of a degree. More than anything, however, they are just trying to sell the brand and the product. It’s also worth noting that most people in the academic sector have spent their entire careers there, are somewhat insulated, and aren’t necessarily up to speed on what’s happening in the economy. The experience for most people I think is that the financial return from a degree is, and has been, steadily diminishing. Where a university education is necessary, this is less a result of the marketable skills you will acquire than because it has become a new kind of baseline threshold of competence in our society. Many employers will assume that you can barely write if you don’t have at least a bachelor’s. And above all, chances of working in your chosen field are extremely slim. @Shrav ever consider that a Masters degree is not a ticket to a job and that you have to try even harder upon graduation to land where you want to be? It’s not a golden ticket, it’s a learning experience that prepares you for the greater obstacles ahead. 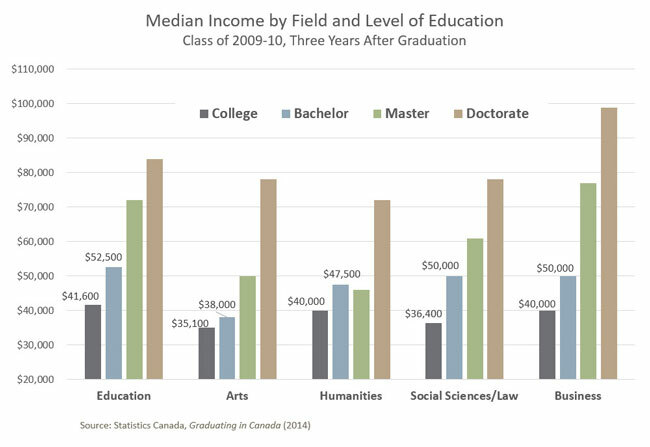 I would be interested to see figure 2 (median income by field and level of education 3 years after graduation) distinguishing between those with doctorates who are in PDF training and those that are not. Furthermore, I would like to see a later follow-up after the limit for duration of PDF training. I suspect that the rates of PDF may be higher in physical/life science fields, confounding the results of this analysis. External partnerships: Research boon or burden?